Earth's moon probably formed during a cataclysmic impact between Earth and a Mars-size object that scientists call Theia. A study of meteorites suggests that this collision may have occurred 4.47 billion years ago, scientists say. The cataclysmic collision between Earth and a Mars-size object that forged the moon may have occurred about 4.47 billion years ago, suggests a study of meteorites with ancient fragments from that cosmic impact. This finding suggests that, one day, it may be possible to find samples of what the primordial Earth was like before the giant impact that formed the moon, or to uncover bits of the impacting rock itself. "By understanding the moon, we can tell the story of the early bombardment of Earth," study lead author William Bottke, a planetary scientist at the Southwest Research Institute in Boulder, Colorado, told Space.com. 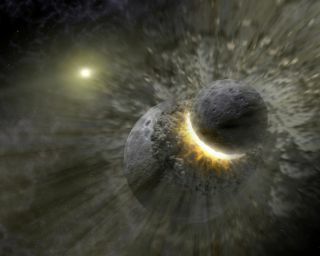 This image from a computer simulation shows how the Earth's moon formed in the aftermath of a collision between Earth and a Mars-size object. However, the precise timeline of this giant impact event is under dispute. The ages of the most ancient lunar samples the Apollo astronauts brought back are still debated, since these samples have typically been battered and heated by subsequent cosmic impacts. "To understand the formation and evolution of our world as well as those in the inner solar system, we need to understand the timing of major events during the planet-formation era," Bottke said. To find out more about this giant impact, scientists developed a computer model of the event. They found that the impact not only created a disk of debris near Earth that formed the moon, but it also ejected huge amounts of rubble — as much as several percent of Earth's mass — away from Earth and the moon. The simulations found that numerous fragments from the moon-forming impact — hundreds of millions of which were at least a mile (1.6 kilometers) long — blasted the asteroid belt, striking asteroids there at speeds of more than 22,370 mph (36,000 km/h), more than twice as fast as typical crashes in the belt. These collisions from the moon-forming impact would have generated superheated material, the researchers said. "In an explosion, there is often collateral damage, where nearby buildings and innocent bystanders are affected," Bottke said. "Investigators can learn about the explosive device and the explosion itself by studying what happened to people, infrastructure, and whether trace amounts of the explosive device can be found among the blast damage. Here, the 'innocent bystanders' were the main-belt asteroids." Collisions against these asteroids in more recent times returned these remnants to Earth in stony meteorites, which the scientists now have analyzed and used to date the age of the impact. "In a sense, the asteroid belt has been an eyewitness to multiple 'drive-by shootings' from the earliest time in solar system history," Bottke said. "By reading the traces left behind, we can use asteroid samples to tell us who did it, when they did it and how they did it." The researchers deduced that the moon-forming impact occurred about 4.47 billion years ago, in agreement with many previous estimates. "We can now use asteroids, for the first time, to tell us about many of the major events that took place in the inner solar system during the planet-formation era," Bottke said. "This gives us a new window on a time period which has been virtually unknown up to now." This sample of the Chelyabinsk meteorite from the 2013 meteor explosion over Chelyabinsk, Russia, shows a network of thin impact melt veins (dark lines) and impact melt pockets (dark blobs). This research "raises the intriguing possibility that trace amounts of the primordial Earth or moon-forming impactor called Theia may still be found on asteroids today, or possibly within some of our meteorites," Bottke said. "It may be simply a matter of looking and asking the right questions. Finding these materials would be one of the Holy Grails of geology — we have no rocks older than 4 billion years old on Earth, and no one knows the exact nature of the original building blocks of our planet." If future research can uncover examples of this impact in asteroid samples, "possibly by getting them from an asteroid sample return mission like OSIRIS-REx, we would have one of the key pieces of the puzzle explaining why our world is the way it is, and what has changed since its infancy," Bottke said. The scientists detailed their findings in the April 17 issue of the journal Science.